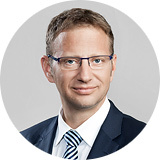 Volker Buchegger has profound experience as a senior consultant. After completing his studies in economics in Vienna and Germany focusing on human resources and organisational development, he oversaw the corporate restructuring of an international production and trading company for 4 years as an internal consultant. Subsequently, he was managing director of a business consulting firm for more than 10 years. He accompanies people in learning and re-training processes according to his motto “change takes place in the minds and hearts of employees –or not at all” and assists companies in organisational development projects as well as (cultural) change processes.